When it comes to the cookery part of food production operations, it is very important to select an appropriate cooking method. The cooking method has a direct impact on the taste, texture, appearance, and flavor of the resulting food product. It involves cooking the food items by exposing it directly to heat such as open fire, coal, grill or electric coil. Meat steaks and whole fish are broiled. It is a method of cooking by placing the food on a mesh of cast iron. Millard reaction brings flavor to the food being cooked. The resulting food is quite dry, reduced with oil. It is ideal for small to medium shaped meat cuts, vegetables, tofu, or cottage cheese. It is a way of cooking food by exposing it to dry radiant heat over open fire, in oven, or at times within surrounding hot embers, sand, or stones. Vegetables, meat, corn on cob, potatoes, and sweet potatoes are roasted. It is a manner of cooking food by exposing it to prolonged dry heat, normally in an oven, hot embers, or on hot stones. The heat is gradually transferred from the surface of the food item being baked to its center which gives it a firm dry crust and a soft center. Baking needs high temperature control. Breads, cookies, pies, and tarts are baked. It is frying the food items with little oil in a pan exposed to high heat. The food in the pan requires stirring and tossing so that it does not burn because of high heat. It promotes browning and Maillard reaction. The food is cooked in more amount of oil than used in sautéing to that a surface of the food is always in contact with the oil. The food is turned occasionally till it gets cooked evenly. The food is immersed in the ample amount of oil that is heated up to its smoking point. The food is turned for even cooking. The resulting food is very crispy. Fritters, Potato chips, Pakoras (Onion-Chick Pea flour fritters), and Vadas are deep fried. It is done by heating liquid to temperature around 70oC to 85oC where liquid in the pan is hot but not bubbling hot. The bubbles appear at the bottom of the pan or pot. Poaching is used for very delicate food items such as fish or eggs. It is done by immersing food item completely in the liquid and heating it at 85oC to 95oC; the temperature is hotter than that in poaching. Bubbles form and gradually rise to the surface. It is the standard method followed for preparing soups and stocks. It is carried out at the hottest temperatures of the three techniques; above 100oC. The high temperature toughens some foods such as meat and eggs. It breaks delicate food items such as fish and vegetables. It is carried out by heating the liquids like water past its boiling point (212o F) and generates steam. Steam carries more heat than boiling water. It is the most appropriate method for cooking seafood, vegetables, and other delicate food items. It includes two step cooking with light frying of food and then immersing it in liquid to make stew. In the first step, the food is fried with adequate oil. 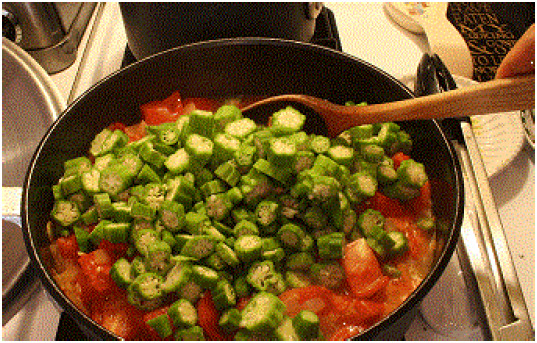 While frying or sautéing, the heat is transferred to food via pan. In the next step, a liquid is added to it and the food is cooked while the pan is covered with a lid. This way, the steam is caught in the pan and the heat is transferred to the food by convection. Meat curries and stews are braised. Braising is used to cook large portions of meats such as beef, pork, and game. The meat cuts are often immersed partially. This is also very similar to braising as far as the cooking steps are concerned. Stewing uses small to medium uniform cuts of tender meat such as poultry or lamb, or vegetables. In case of stewing, the cuts of meat or vegetables are completely immersed in the liquid. Stewing takes little lesser time than braising.